Why are Amish-made products popular? Products made by Amish attract buyers for different reasons. Some view them to be of higher quality than comparable products. Others appreciate the “story” behind the product. A perception that they are handmade or more “authentic” than competing products may also add to their appeal. Some people like to purchase from the Amish because it allows them to interact with Amish people. Are Amish products “all-natural”? Though many Amish appreciate foods with a minimum of artificial additives, Amish do sell products that are not solely based on natural ingredients or cultivated organically. To take one example, most Amish farmers use conventional fertilizers, though a growing minority of Amish farm according to organic standards. If you are not sure about the origin of a product and it is important to you, be sure to ask. 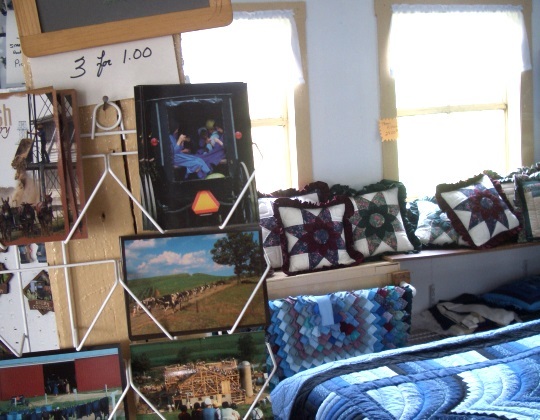 Postcards and quilt products for sale in an Amish-owned shop. Volant, PA.
Do Amish sell only Amish products? Just because you buy it from an Amish person, doesn’t mean it was made by Amish hands. Amish do re-sell products made by non-Amish producers. Examples of this include some foods sold in market stands and restaurants, or clothing such as socks purchased in Amish dry goods stores which may be made by non-Amish domestic or foreign producers. Is everything labeled “Amish”, really Amish? Not all Amish-labeled products are necessarily Amish-made. A number of products use Amish-derivative names, such as “Amish Country“, “Amish Recipe”, or “Amish-style”, or text incorporating the word, such as “based on an Amish formula”. Outsiders realize the marketing power of the Amish and since it is not trademarked, may use the name freely. Where can I buy Amish-made products? You can purchase Amish items direct from the Amish in many places. 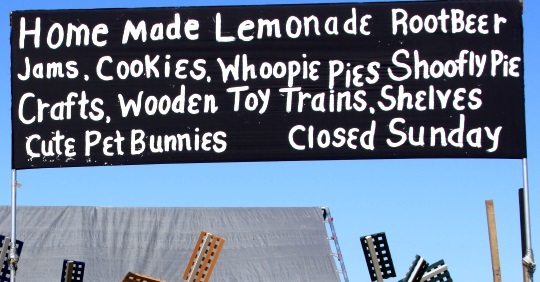 Roadside stands and other businesses are common in Amish communities. Non-Amish retailers sell an array of Amish products. Quite a few online outlets also sell Amish-made goods. Our directory of Amish products and businesses lists a number of sources. To Cite this Page: Wesner, Erik J. “Products.” Amish America. Erik Wesner, 9 Apr. 2015. Web. [Date Accessed]. <http://amishamerica.com/products/>. if he’s standing a yoke of large indefinite quantity. I am looking for wheat straw to make crafts. Is it something I can get in this community ? If so please let me know.